National Ice Cream Day (Sunday, July 16) snuck up on me. I’m so glad I noticed it being talked about online, as I’d have been really sad to miss the day when ice cream eating is basically mandatory! Store bought ice cream is good; ice cream parlor ice cream is better, but homemade ice cream…is..the..best. And if that ice cream is lower in sugar than usual, even better. 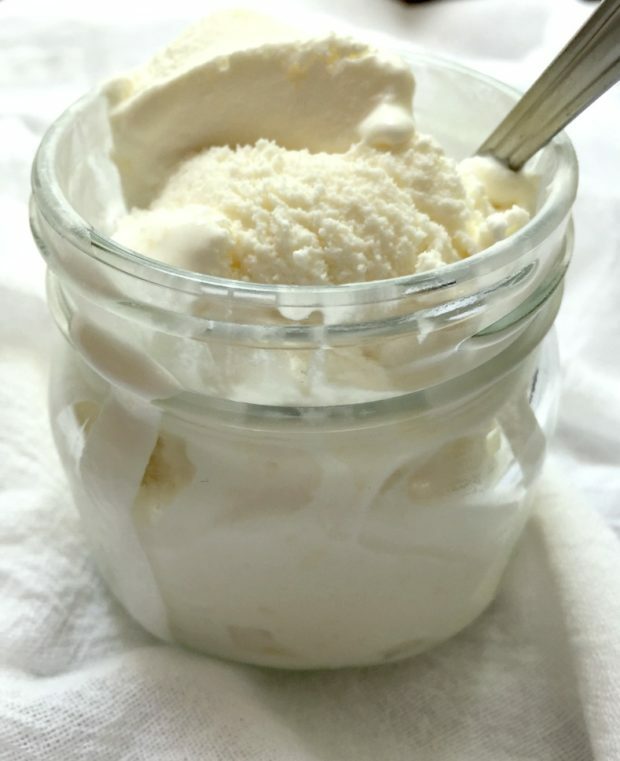 Our ridiculously Easy Lower-Sugar Vanilla Ice Cream Base is made in your slow cooker, then simply chill it thoroughly and its ready to go into your ice cream maker. Vanilla ice cream is supremely customizable to your taste, so feel free to switch it up by adding chopped nuts or fruit or drizzle your scoops with your favorite topping. You can also give it a completely different flavor using extracts, spices, fresh herbs or whatever strikes your fancy. Here are some tips for prepping add-ins (from Serious Eats). This recipe uses Trivia Baking Blend instead of regular sugar. This baking blend is mix of erythritol, sugar and stevia. It has 75% fewer calories per serving than regular sugar. But, because it does contain some sugar, the resulting ice cream doesn’t get super-duper hard like completely sugar-free ice creams do. It’s still hard, but it’s scoopable, even after being in the freezer for hours. Of course, because it’s homemade, it does melt quickly, so if you want to soften it, let it sit out on the counter for just a couple minutes. I like “real” ice cream that starts with a cooked base (aka custard base). 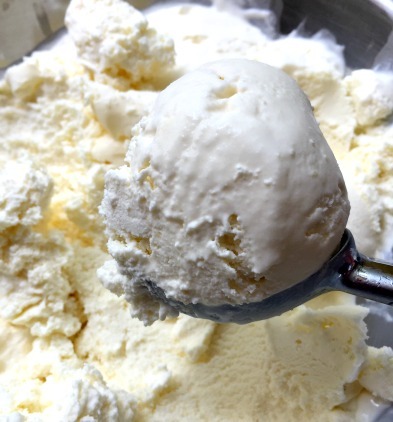 Cooked ice cream bases have eggs, and combined with the heavy cream, it makes a richer-tasting ice cream. I did not decrease the amount of heavy cream in the recipe because I wanted to retain this richness. A couple notes: This delicious ice cream base works well in any ice cream maker that you have. (I did not try freezing it without using an ice cream maker.) Once thickened in my Cuisinart ice cream maker, the ice cream is more like soft serve, which is good sometimes, but usually I freeze ice cream it a bit longer in the actual freezer (covered) to get it more like hard ice cream. If all this seems like too much trouble today, you can certainly just go get ice cream somewhere else on National Ice Cream Day. Or how about this idea, go out for ice cream, and also make your own! Hey, it’s summer; you’re allowed. Mix all ingredients together in the slow cooker crock. Cover and cook on LOW for 2 1/2 hours, whisking several times during cooking. When cooking time is done, test to be sure it's ready using the "wooden spoon test." To do so, dip a clean wooden spoon into the mixture, then run a clean finger over the back of the spoon (through the mixture). If your finger leaves a "trail" through the mixture, the base is done. If no "trail," cook another 1/2 hour and test it again. Transfer the ice cream base to a bowl, cover the surface with plastic wrap (let the wrap touch the surface of the mixture), and let it cool completely in the refrigerator—preferably overnight. Before pouring the base into the ice cream maker, skim off any congealed base mixture floating on the surface of the mixture. Freeze ice cream according to ice cream freezer manufacturer's directions. If you have a large ice cream maker, you can easily double the ingredients in this base for a larger yield.